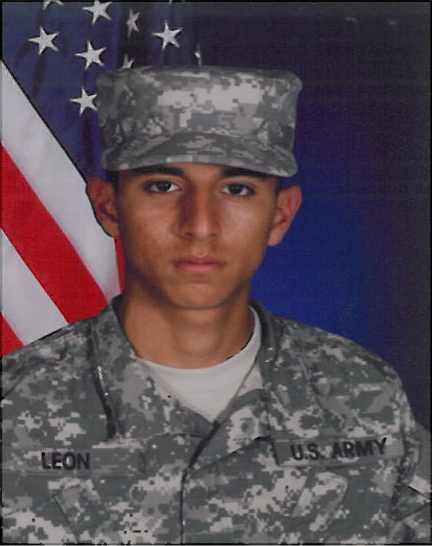 It was never easy for me to know that my brother, Yusuf Leon, was going into the military. I had just finished my eighth grade year when I found out he had signed up for the U.S. Army. At first, I figured he would change his mind and go after his dream career of cross country, but as my freshmen year came around I realized I was wrong. Yusuf was the oldest brother I had and my only full blooded brother, which made it that much harder to let him go. Yusuf gave up two running scholarships in order to join the military. Our cousin David, who is an ex-veteran for the United States Army had accompanied my brother to the recruit center where he was told it was better to join rather than end up dead, a troubled kid with no respect towards others, or in jail. That was the day my brother decided to sign up for the military. I always wondered what the reason behind my brother deciding to join was and when I asked him this question over the phone he replied, “I wanted to support my family. I wanted to make sure that I had a future set for myself Jen; where I know I won’t be dead on the streets or in jail. But, most importantly I joined so that you guys (meaning my other older siblings and I) wouldn’t have to make the choice of joining.” As I thought back to when we were younger I always remember how my other older brother, Juan Ayala, wanted to go into the military. Though, as he got older his desires changed and that’s when Yusuf made the decision to join. My brother only came down a couple weeks each year. It was hard knowing he wouldn’t be there for our birthdays or holidays, but I knew he was okay. I always wondered why he couldn’t be away longer than just a couple of weeks at a time so I asked. Apparently leave is earned for time and service. Every two months a soldier gets two and a half days of leave. Per each year a soldier is allowed to take up at least thirty days but that is only if they have those days saved up. He also said that leave has to be put in two weeks in advance before you can take it unless it is emergency leave. Emergency leave can only be taken when something happens to his immediate family meaning his siblings or our parents. Yusuf has been in the Army for a good three years now. He re-enlisted for another three and even though I know it was his decision I couldn’t help but feel the dread resurfacing into my mind. I never liked having my oldest brother so far away from me. I’ve always been a family loving girl and knowing that it was going to be months on end before I got to see my brother devastated me. But, at the same time I felt this kind of excitement to know what it was like to be in the Army. I asked Yusuf what was his favorite and least favorite part of being in the military was and he replied, “I love knowing that I’m making something of myself and I’m learning things that not most people would know, but I hate that I’m being treated like a kid instead of an adult. Another thing I despise is that the higher ranks force us to give them respect but they won’t always return it to us.” Of course this caused me to wish my brother was back home, knowing that he wasn’t getting treated right all the time. But I kept my feelings to myself and just took it one step at a time, waiting for the day when he would come back home but for good. We’ve come from a family of military members, which got to me wondering what Yusuf’s inspiration for joining the Army was. I knew he wanted to make sure his family was taken care of, and he wanted to make sure he could make something of himself but his inspiration was different. “I did it for my grandfather,” Yusuf responded. Before leaving for the Army, Yusuf lived with our grandparents, Rosemary and Ruben Flores. He would have talks with our papa (grandpa) and it would always end in tears. He hated seeing how much our papa suffered. “He would cry all the time and say how he missed our cousins Jen. I hated knowing how much he was suffering. I wanted him to be proud of me. I wanted to give the family name honor and make something of the family name. Papa was my inspiration to join the Army.” Even if he’s so far away Yusuf and I have come to grow closer to each other. He joined the Army to make something of himself and to make sure that his family was taken care of, and that’s exactly what he’s doing.